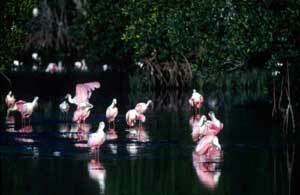 Library image #10: Colony of Rosette Spoonbills. The United States Congress designated the J.N. "Ding" Darling Wilderness (map) in 1976 and it now has a total of 2,619 acres (2619.13 acres, technically). All of this wilderness is located in Florida and is managed by the Fish and Wildlife Service. The northern portion of the 6,400-acre refuge is a mass of mangrove islands designated as J. N. "Ding" Darling Wilderness. Here, you can expect summer temperatures in the 90s and winter temperatures in the 70s. Humidity is almost always high, and afternoon rain showers are common in the summer. Mosquitoes and no-see-ums can be abundant at times, especially in the summer. Other residents include alligators, raccoons, bobcats, river otters, and marsh rabbits. Creatures for whom the refuge was established include such migratory birds as ospreys, brown pelicans, moorhens, ducks, herons, egrets, anhingas, wood storks, and roseate spoonbills. Motorized boating is allowed in designated areas. Kayaking, canoeing, and sportfishing is allowed throughout the open water areas of the Wilderness. Public access is restricted in designated closed areas and bird rookeries. Jay Norwood "Ding" Darling, the Pulitzer Prize-winning cartoonist, helped pioneer the conservation movement, serving as head of the U.S. Biological Survey (forerunner of the U.S. Fish and Wildlife Service), creating the Federal Duck Stamp Program, starting the Cooperative Fish and Wildlife Research Unit Program, and providing strong support for the expansion and administration of the National Wildlife Refuge System. Today, more than half of the 12-mile subtropical barrier island called Sanibel Island has been protected and bears witness to the legacy of the conservation visionary J. N. "Ding" Darling, through the National Wildlife Refuge named in his honor and the private conservation foundation he inspired. Planning to Visit the J.N. "Ding" Darling Wilderness? How to follow the seven standard Leave No Trace principles differs in different parts of the country (desert vs. Rocky Mountains). Click on any of the principles listed below to learn more about how they apply in the J.N. "Ding" Darling Wilderness.